REJOICE! is a very dumb title for a very smart book. The title smacks too much of those mindless felt and burlap banners from the trendy 1960’s which look like an embarrassment to us now. But this book has the finer arts in focus. The Rizzoli publication, which is a compilation of twentyfour essays by a variety of Italian scholars, looks at 700 years of papal artistic patronage for the Jubilee Years that brought pilgrims from around the world to Rome. The superbly illustrated coffee-table book covers both art and architecture. Pope Boniface VIII promulgated the first Jubilee in the year 1300. His annus iubilaeus was rooted in the tradition of the Hebrew feast of the Jubilee. The feast occurred every fifty years and was dedicated to the sanctification of society. There was neither harvesting nor sowing; the land was left fallow. Freedom was restored to the slaves, property returned to its original owners. Debts were cancelled. For the Christians of the Middle Ages, the call to Rome was an opportunity to cancel temporal punishment due to sin. By papal edict, the faithful could gain indulgences by going on pilgrimage and visiting the sacred basilicas in the Eternal City. How often these Jubilees would be held was a matter not settled for several centuries. One-hundred-year intervals and thirty three-year intervals (supposedly the length of Christ’s time on earth) were tried until it was finally decided that the Holy Year would occur every twenty-fifth year, save for special occasions when an “extraordinary” Jubilee might be called for special reasons. Throughout the centuries, the popes prepared for such events by sponsoring elaborate building programs and commissioning beautiful works of art. A sweeping view of these achievements is the object of these essays, and they have been masterfully edited by Maurizio Calvesi, a professor of art history at the University of Rome. Students of architecture will appreciate especially the chapter on the Jubilee called by Pope Sixtus IV in the year 1475. Because the Holy Land was controlled by the Mohammedans, Rome took deliberate means to become a substitute destination for pilgrims who longed to go to Jerusalem. The papacy appropriated for itself and at the same time confronted the potent symbolism of the Jewish High Priesthood and the glorious Temple of Solomon. The scholars of this book prove that it is by no mere coincidence that the dimensions of the Sistine Chapel are identical to the dimensions of Solomon’s Temple. An inscription found in the Chapel reads: “You, Sixtus IV, inferior to Solomon in wealth, but superior to him in religion and devotion, consecrated this immense temple.” In 1500 the Jubilee of Alexander VI embellished the Church of Santa Croce in Gerusalemme, reputedly built on the site of the Empress Helena’s palace, which contained the many relics of Christ’s Passion retrieved from her extraordinary archaeological expedition to the Holy Land in the fourth century. He also had a group of medieval and ancient buildings hurriedly demolished (including the fabled Meta Romuli, a sepulchral pyramid named after the founder of Rome) to create a traffic-friendly avenue that connected Castel Sant’Angelo with St. Peter’s Square. Running out of time, the pontiff was forced to mobilize pilgrims to help clear the rubble themselves! The conflict between the remains of antiquity and papal building programs continues to haunt the Jubilee Year, but today more conservationist minds prevail. The art and illustrations of REJOICE! tend to favor painting and prints over architecture, but throughout the book the various art forms tend to complement each other rather than compete. How else might the authors have portrayed the developments made at the Basilica of Santa Maria Maggiore, the Piazza of St. Peter’s, and the Pantheon without utilizing the graphic work of Piranesi? 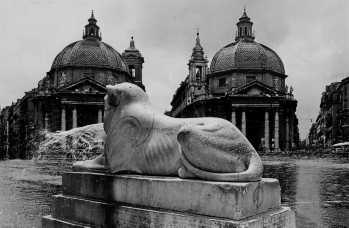 Beautiful photographs record the current state of other Jubilee buildings: the Casinodel Belrespiro, the twin churches of the Piazza del Popolo, the sacristy of St. Peter’s, the Museo PioClementino, and the churches of Divina Sapienza and Maria Mediatrice in Rome. In comparison, a model for Richard Meier’s Church for the Jubilee of 2000 looks jarringly out of place. This modernist exclamation in the realm of classicism seems less a prediction for the future than a faint echo of masterpieces from the century past, most notably the Sydney Opera House. Yet it is the variety of artistic commissions recorded in REJOICE! Tying particular pontiffs with particular monuments, that reinforces in the reader’s mind the important role of patronage in the advancement of the arts, a noble activity that not only dazzles the eye, but feeds the soul. Rev. Michael Morris, O.P., is professor of Art History at Berkeley and author of a monthly column on sacred art in Magnificat.